Cuban Fishing, 3-7-15, Malecon Sunset By ManWithAToyCamera Via Creative Commons. Cuban Fishing, 3-7-15, Fishing On The Malecón. 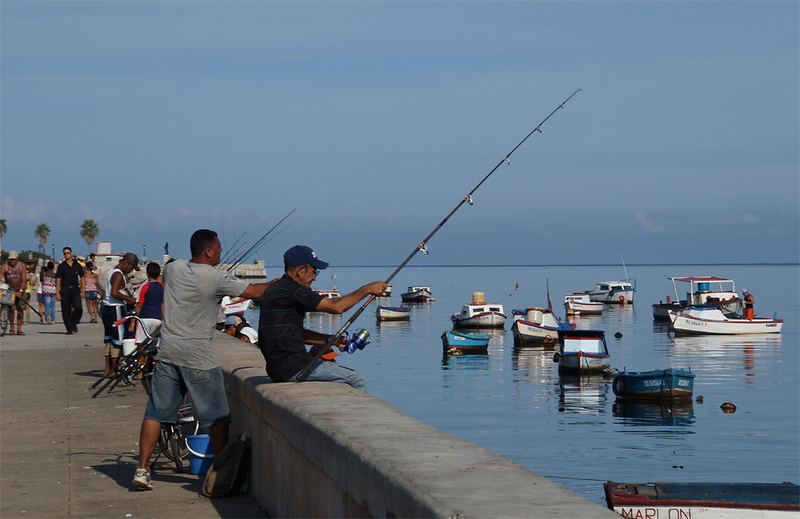 Cuban Fishing, 3/7/15: Many Cubans, particularly those of more limited means, fish the Malecón for fish to eat and sell. The Malecón (officially Avenida de Maceo) is a broad esplanade, roadway and seawall which stretches for 8 km (5 miles) along the coast in Havana, Cuba,from the mouth of Havana Harbor in Old Havana, along the north side of the Centro Habana neighborhood, ending in the Vedado neighborhood. New businesses are appearing on the esplanade due to economic reforms in Cuba that now allow Cubans to own private businesses. Construction of the Malecón began in 1901, during temporary U.S. military rule. Cuban Fishing, 3-7-15, Malecon By francois.sorrentino Via Creative Commons. 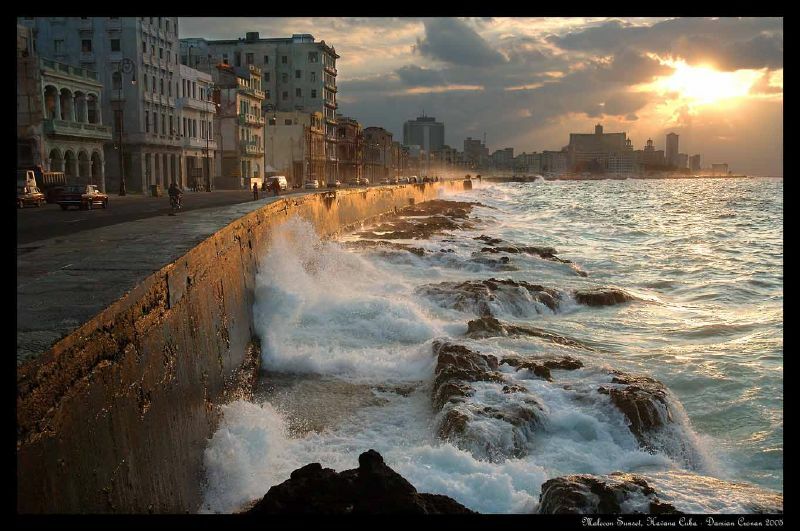 The main purpose of building the Malecón was to protect Havana from the water and the so-called Nortes, but in reality, it wound up serving more for nighttime promenades by Habaneros, for lovers and most of all for individual fishermen. To celebrate the construction of the first 500m section of the Malecón, the American government built a beautiful roundabout at the intersection of Paseo del Prado, which, according to architects of the period, was the first one built in Cuba with steel-reinforced concrete. In front of the roundabout, where every Sunday bands played Cuban melodies, the Miramar Hotel was built, which was very much in fashion for the first 15 years of independence and which was the first one where the waiters wore tuxedos (dinner jackets), vests (waistcoats) with gold buttons, and did not have moustaches. 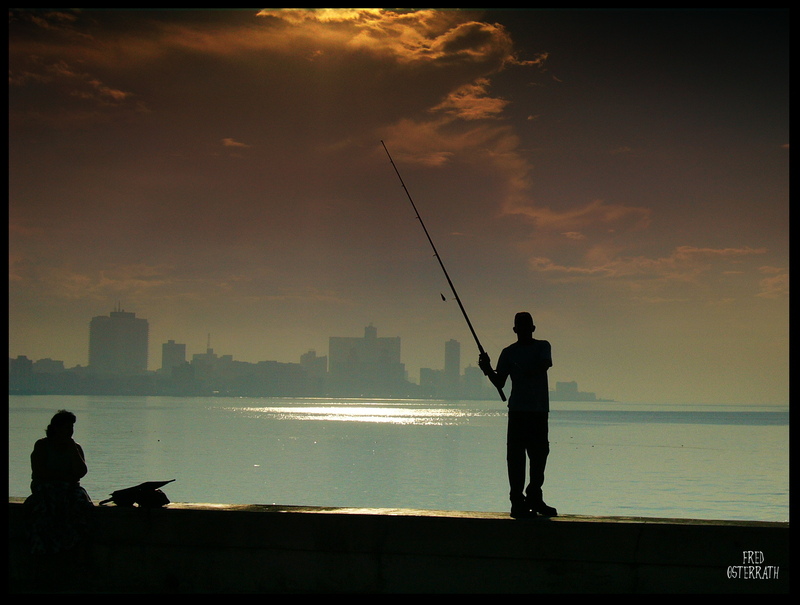 Cuban Fishing, 3-7-15, Pescador en el malecon By Fredo_photo Via Creative Commons. Subsequent Cuban governments continued the extension of the first section of the Malecón. In 1923 it reached the mouth of theAlmendares River between K and L streets in Vedado, where theUnited States Embassy was built, the José Martí Sports Park and further out, the Hotel Rosita de Hornedo, today, the Sierra Maestra. The Malecón continues to be popular among Cubans, especially among those of lesser means whose other means of entertainment are limited. It is also a means of income for poorer families, as individual fishermen cast their lures there.